Master Splinter, the mutant, adult-human–sized rat sensei of the Teenage Mutant Ninja Turtles, invites readers to study the way of the ninja. He first presents a series of lessons with the help of the Turtles and their friends. Splinter narrates the lesson on tradition. Leonardo, the Turtle leader, takes up discipline. Raphael handles strength, Donatello, technology, and Michelangelo, creativity. Stealth, friendship, and teamwork follow. Each lesson is composed of two to four pages of admonitions, platitudes, and pictures. Then ensues a catalog of TMNT enemies. Each is described in a paragraph or two with several pictures and tips on defeating them; these tips reference the previous lessons. Finally, there are a couple “missions” that focus on stealth. Many chapters feature a cheeky comment scrawled in orange ink by Michelangelo in the margins (“I can do science stuff, too. I’m great at dancing the robot”). Conti does a good job channeling the characters’ voices in few words. The bright, abundant artwork is right out of the Nickelodeon television show now in its fifth season. It’s a slim book, but the elevated vocabulary makes this best suited to middle graders. 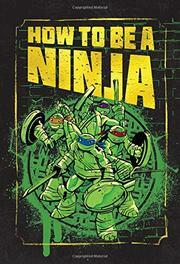 Reluctant readers who love the Turtles will likely read and reread and use the ninja tips to sneak up on family members.